When looking for family-friendly lodging, there are several things to consider. Does the hotel offer cribs? Are there bathtubs or only showers? Does the hotel’s restaurant offer high chairs? Are the rooms large enough to accommodate a family? And finally, how close is it to local attractions? 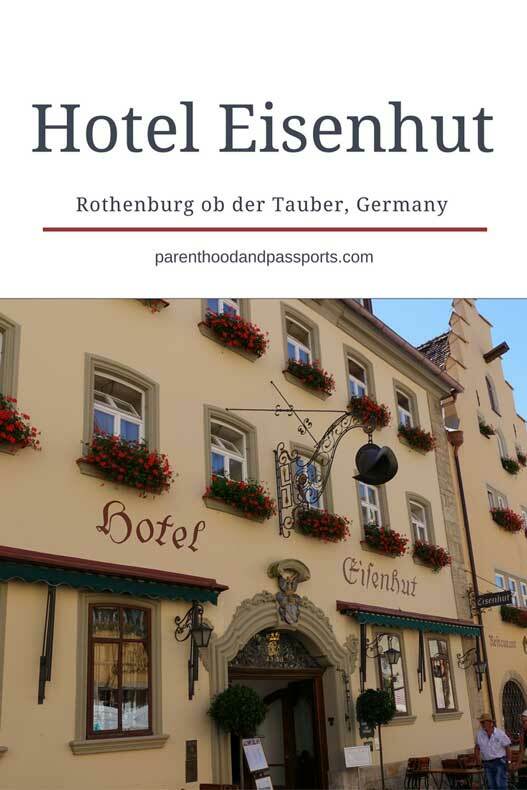 Taking all of this into consideration, Hotel Eisenhut in Rothenburg ob der Tauber, Germany is a wonderful, family-friendly place to stay. 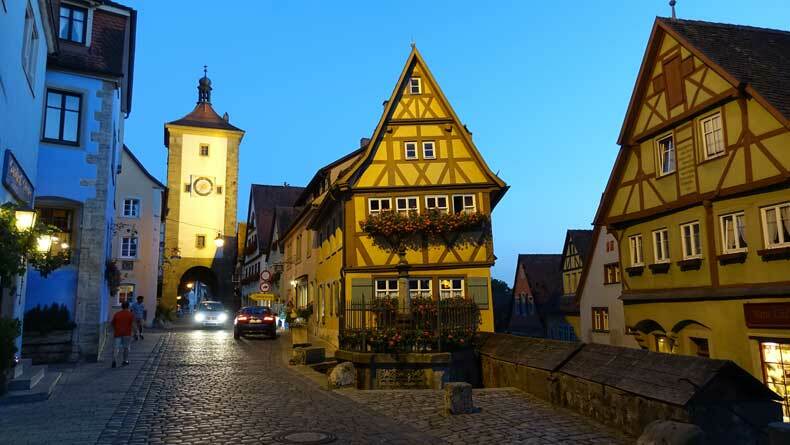 While many people visit this storybook town as a single day trip, it is definitely worth spending more than one day in Rothenburg ob der Tauber. Location is always one of the most important factors for us when choosing a hotel. The location of Hotel Eisenhut couldn’t be better! 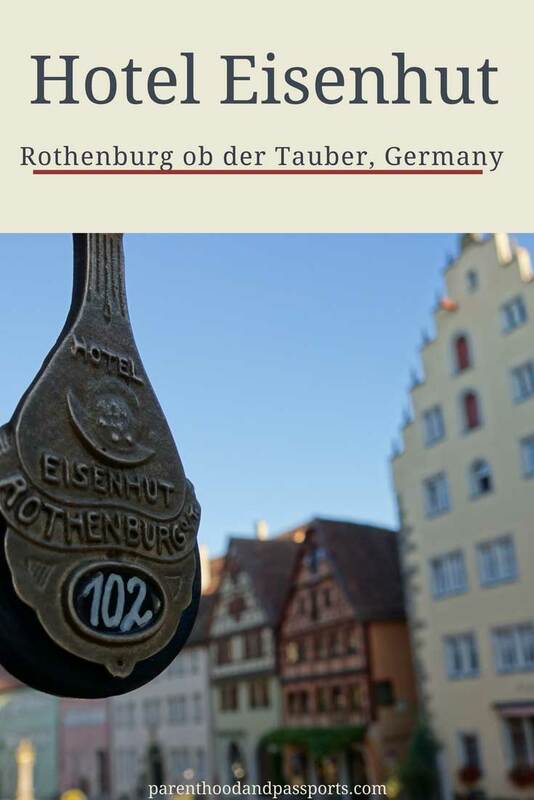 The hotel is ideally situated inside the city’s walls, directly next to the famous Christmas Museum in Rothenburg ob der Tauber and only a two minute walk to the Marktplaz or main square. The town is fairly small and very pedestrian friendly. 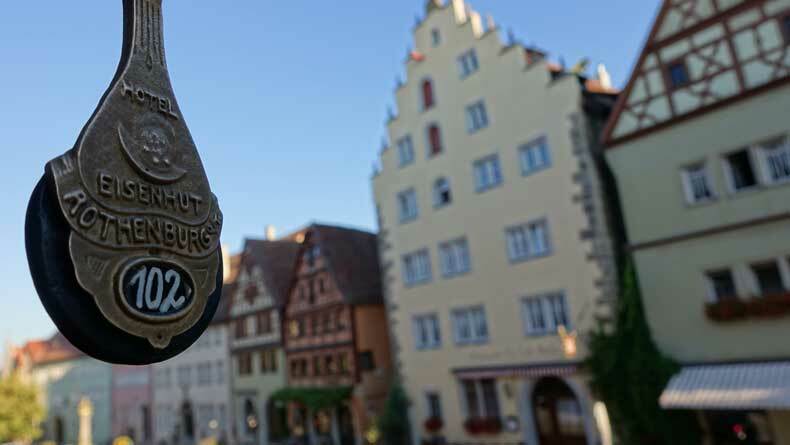 Hotel Eisenhut is approximately a 5 minute walk to the city’s wall, and a 5-10 minute walk to the most picturesque area of Rothenburg ob der Tauber. Our room was on the second floor and had a wonderful view of the street below. 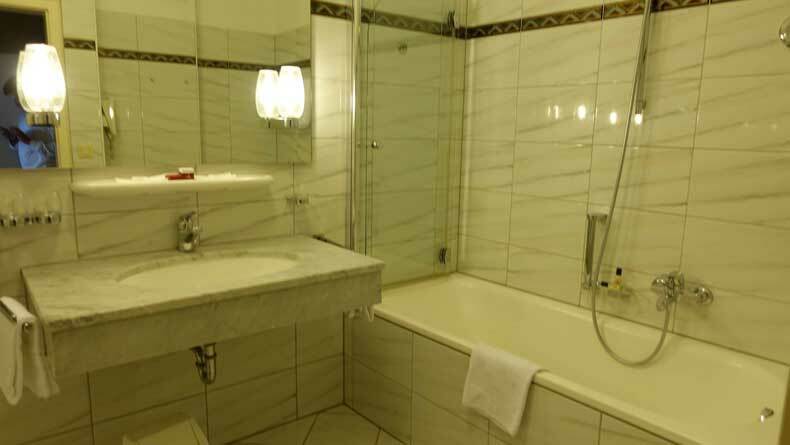 When it comes to amenities, Hotel Eisenhut has everything you need. 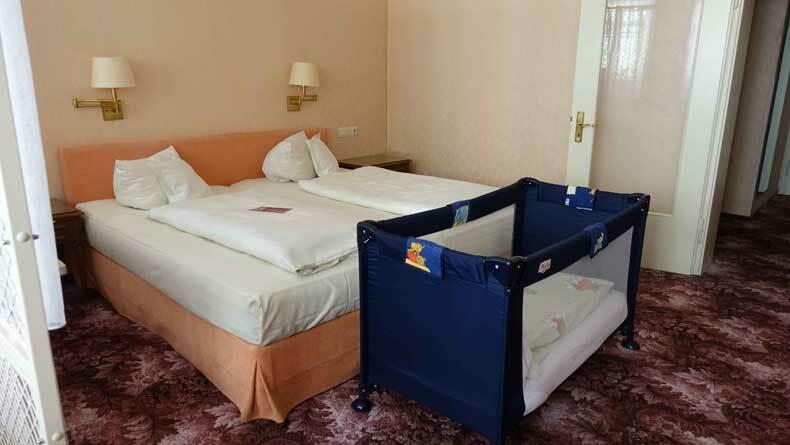 Toiletries, a blow drier, a mini bar and fridge… They also provide a very comfortable crib and baby bedding free of charge, which isn’t always the case everywhere. The service is wonderful, and the staff is very friendly and speaks wonderful English. One night, the receptionist even got us milk from the kitchen so our toddler could have her nightly sippy cup before bed. (A bad habit I haven’t been able to break her of yet.) We had just arrived that day jet lagged and exhausted and hadn’t had time to buy any milk. The receptionist filled her sippy cup for us in the kitchen and didn’t charge us for it, either. 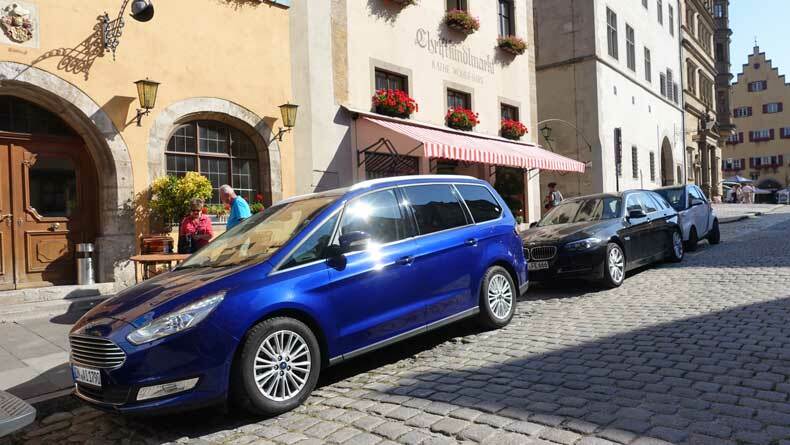 One other amenity that was very beneficial was the street parking right outside the hotel. There is an extra charge for this, but it definitely helps to not have to haul luggage and a baby from a parking lot blocks away. The one thing I wish Hotel Eisenhut had was air conditioning. In my research, I didn’t find any hotels within the city walls that had A/C, and it wasn’t a problem. We had an oscillating fan that kept us cool at night, even in late August when it was still really warm outside, but air conditioning would have been a nice feature to have. The rooms are large. Not just by European standards but by American standards as well. Our room had a sitting area with a couch and two chairs, a desk, a large bathroom with a tub and plenty of space for a crib. The bed, linens, and pillows were very comfortable, which was great considering we were so tired from a long day of traveling across the pond. One of the things we loved about Hotel Eisenhut was the charming decor. 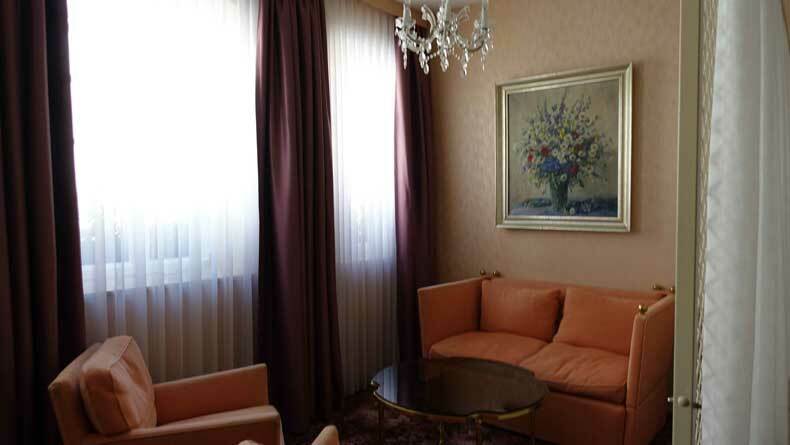 The rooms have an antique feel to them that reminds me of my grandmother’s house. 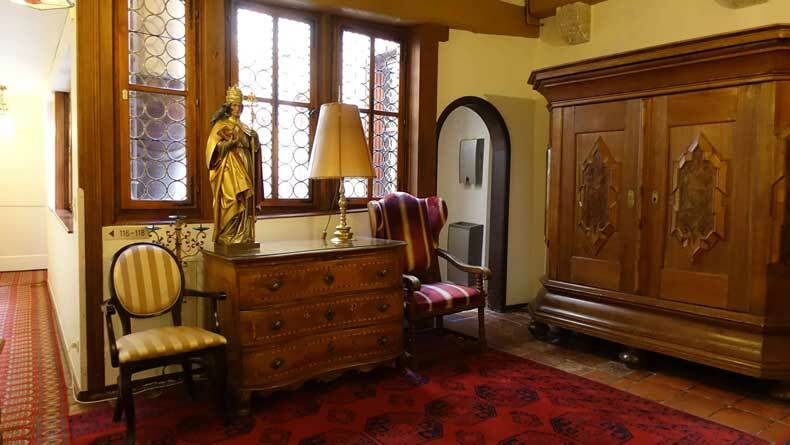 Even the hallways and lobby are decorated with old, medieval furnishings. The hotel definitely has a unique ambiance that perfectly compliments the atmosphere of the enchanting village. 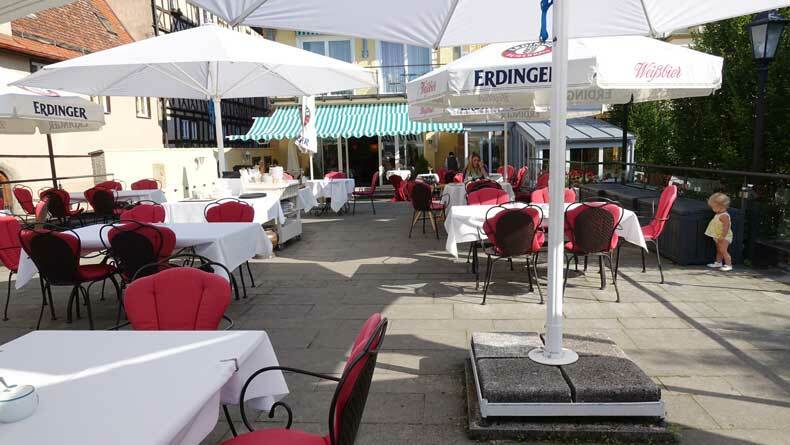 The restaurant at Hotel Eisenhut offers a breakfast buffet as well as lunch and dinner for an additional charge. There is a lovely terrace off the back of the hotel that overlooks the green valley surrounding Rothenburg ob der Tauber. The breakfast buffet is tasty and plentiful but the beautiful terrace is my favorite part! We did not eat at the restaurant for lunch or dinner, as there are a lot of dining options within walking distance. 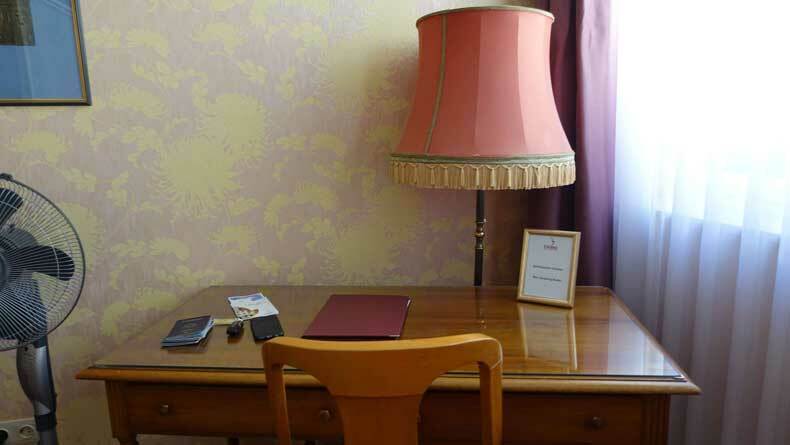 Overall, we had a lovely stay at Hotel Eisenhut, and we would definitely stay there again. While some of the furnishings are a bit outdated, the ideal location of the hotel, the friendly service, and the old world charm more than made up for any shortcomings. 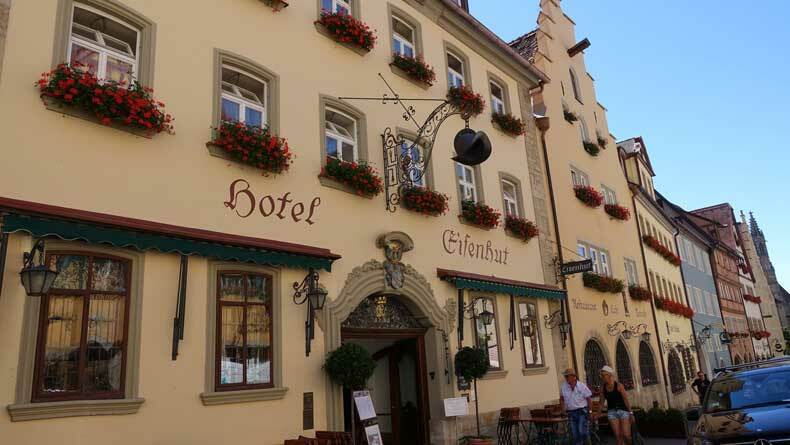 Have a question or comment about Hotel Eisenhut in Rothenburg ob der Tauber, Germany? We’d love to hear from you. Leave us your thoughts in the comments below. Excellent review – we always look for the best located places, too. I’ll be sure to look these guys up when we are looking for our next Bavarian adventure! Thanks. I think the hotel has the best location in the little city. 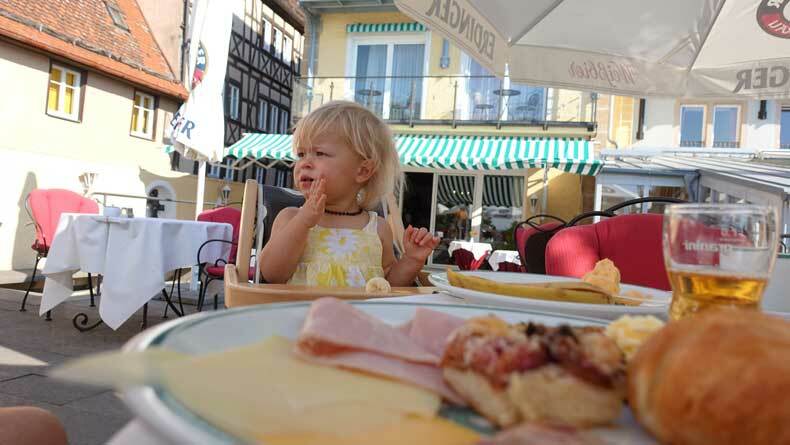 If you ever stay there have breakfast on the terrace at least once! It’s beautiful. Happy travels! Trip Advisor drives me crazy sometimes because people will complain about everything! I always try to look for hotel reviews from seasoned travelers and bloggers to gain a true traveler’s perspective of a place. The bathroom was huge! Which is great when you have a kid to bath and get ready for bed. It’s amazing how much extra space is needed for a tiny human. Lol. This hotel looks so cute, and it’s in a lovely part of town. It’s always nice to have a bigger hotel room when traveling with family, so you get a little extra space to spread out. Looks like a wonderful place to stay! Agreed! Our lodging “musts” have changed since becoming parents. I usually only stay in hostels, but this place sounds seriously nice!!! Lol thanks for your review! It was really informative!! That place looks adorable, I would love to stay there and will keep this place in mind! Omigosh, that is awesome! It is such a great place to take kids. It makes me so happy to hear you still have fond memories of it from visiting as a child. I know my daughter is still VERY young, but part of me hopes she have even a tiny memory of this magical place one day. Thanks for commenting and happy travels! Sounds like a great hotel overall. The location is definitely great being right in the city. Also, I love how they provided milk free of charge. It is the little things that make a hotel great! Completely agree! 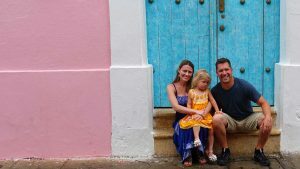 Traveling with kids can be tough… Especially at the toddler age, so a hotel that goes above and beyond gets five stars in my book! This looks like such a cute place to visit! (the town and the hotel). I always think location is one of the most important things to consider when choosing a place to stay. Thanks for this post!